2. Today I am thankful for being home on convalescent leave. I'm glad I got time to recuperate after my surgery. I thought 2 weeks was a long time, but despite what my brain thought, my body appreciated the 2 weeks to get back on the horse..
4. A quirky thing about me is I decided on a set of colors to decorate in.... I've slowly applied those colors to practically everything in my life. The living room, the kitchen, Phil, the bedroom, my clothes... Yay for light green, light blue, and brown!! 7. On my night stand you would find The 2nd Game of Thrones book, lotion, postcards, an empty cup that had water in it, a lint ball, and close-by in my headboard is chapstick and fingernail clippers. YAYYY!!!! Lauren @ the little things we do is restarting the Fill in the Blank Fridays!!! 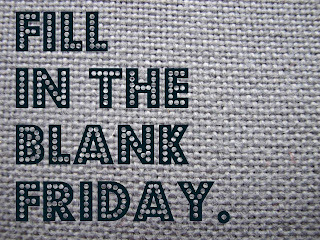 Not that I don't already have 10 million Fill in the Blank Friday drafts created, but yay for doing current Friday blanks!!! Now I feel like I need to email her some blanks since I love doing this sooo much.. Any suggestions?